People have celebrated festivals for thousands of years in the bleak mid-winter. The festivals, usually involving fires and feasting, around the mid Winter Solstice have many names, Yule, Christmas or Saturnalia (the Roman festival around the middle of December). Lights are central to all of these festivals. 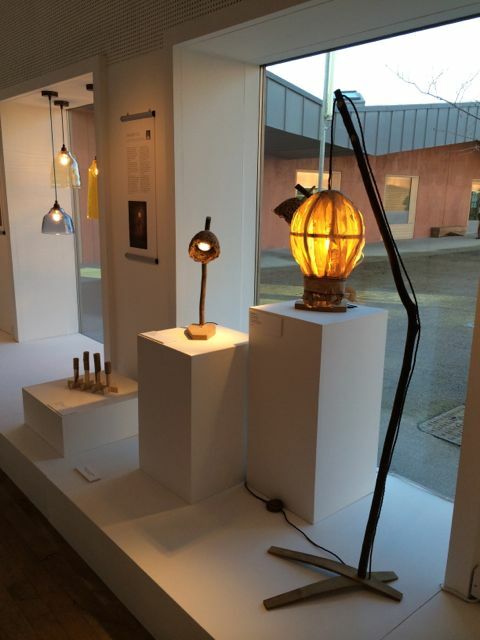 As we decorate our homes with lights, the Illuminate exhibition at the Ruthin Craft Centre lights up with a selection of lighting from young designers. Among the highlights for me were the Rod Standard lamp (pictured right) from Sebastian Cox. The stem is a steam-bent hazel rod, and the shade is made from fine hazel shavings. The hazel is grown locally to Sebastian and he harvests it every winter. Coppicing is a way of cutting and managing trees, creating a diverse woodland, and a sustainable source of timber. The desk lamp’s shade is made from compressed hazel fibres, and casts a warm glow. Drws y Coed means Door to the Woods and the row of lights (left) are laser-cut with intricate patterns to create effect of dappled light in the woods. The lights are made of local Welsh timber and plywood. The designer, Hannah Wardle, grew up in the Clwyd Valley, an area with much woodland, and her experience informs the materials and light effects of her products. Other influences stem from an interest in Japanese architectural ideas and the formal experience of an MSc in Light and Lighting at Bartlett, UCL, and 6 years working as an architectural lighting designer. 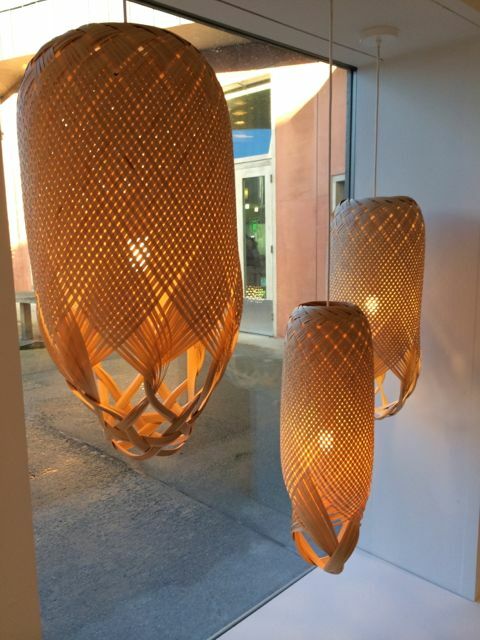 Claire Norcross, former head of lighting at Habitat, also takes her inspiration from the natural world, often super scaling a microscopic detail from the natural world to create a surface or structure. I also appreciated the subtle engineering evident in the Lock Lamp, a collaboration between Colin Chetwood and Nick Grant. The ‘lock’ stands for the mechanism that positions the light, whether extended, raised or rotated, without the use of springs, counter-weights or screw clamps. A neat, elegant solution that is simply functional. For Louise Tucker it is understanding her materials and the intervention of the hand that is central to the design process. 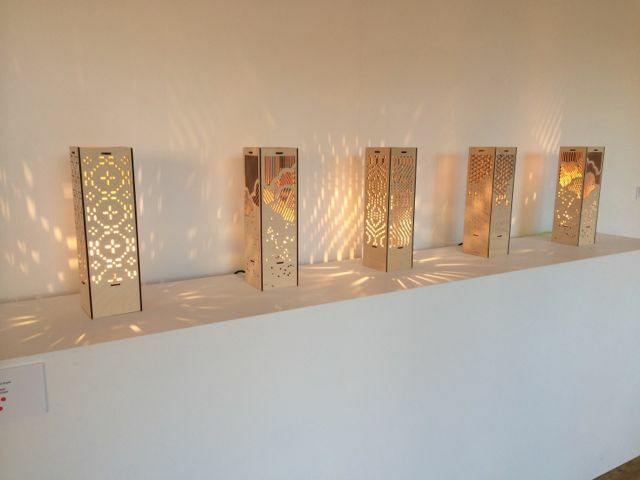 Louise has chosen Pren, the Welsh word for wood as the name for her collection of light sculptures. Each light is a developed by making a series of intricate small-scale models of the three dimensional structures and refining the models until satisfied the structure of the weave echoes the organic curves of the sculpture. Hand-making is the alchemy that turns the natural materials into these sophisticated forms showing the subtle beauty of the materials to their best advantage. Illuminate runs until 4th February 2014, and entrance is free.